Hoteliers can now get real-time on-premises information on guest satisfaction, enabling service recovery, operational improvements and a great guest experience. Collecting guest feedback is a critical aspect of effectively managing hotel operations. Many hoteliers still rely on comment cards, which are problematic in many ways: They are hard to read and aggregate, take time and effort to complete, and are often collected after a guest has checked out, when it’s too late to recover from a negative experience. 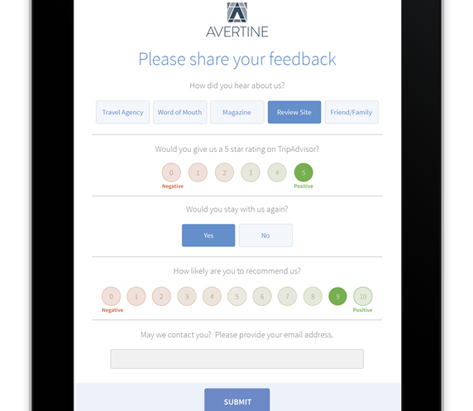 Revinate’s On-Site Surveys revolutionizes the feedback collection process. With an engaging iPad experience, guests can provide critical feedback, in thirty seconds or less, about their experiences at the hotel. And because it happens during their visit while they are on site and experiencing the property, the responses are often more candid and relevant. Hoteliers can collect targeted customer feedback throughout the property with customized surveys for the lobby and check-in areas, the restaurant, spa, pool area meeting space, and more. Hoteliers can then turn happy guests into promoters by automatically emailing them and encouraging them to write a review on sites like TripAdvisor. To ensure hotels can quickly take action, staff members receive alerts when responses are collected so they can resolve guest issues in real time. Likewise, management can log in to review aggregated reporting to make critical operational decisions. 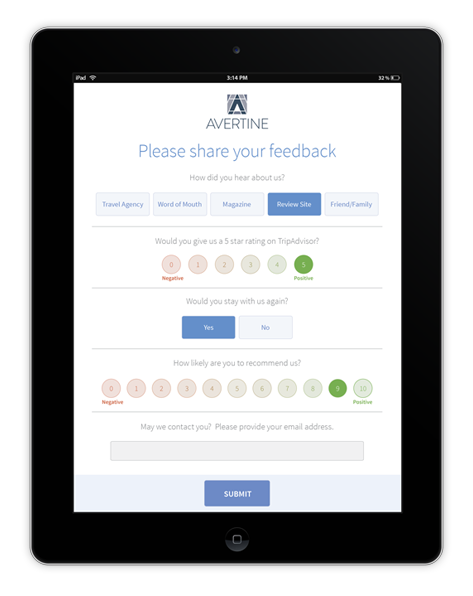 On-Site Surveys is fully integrated into the Revinate platform, which includes a full suite of guest feedback solutions across the guest lifecycle, including Online Reputation Management, Post-Stay Surveys and On-Site Surveys. Customers benefit from a 360-degree view of all guest feedback. On-Site Surveys software can be easily downloaded to a hotel’s existing iPad. A hardware package with an iPad, secure customized stand and peripherals is an optional add-on. Visit Revinate in Booth 1620 at HITEC in Los Angeles for a demo, or to learn more, go to https://www.revinate.com/products/#on_site. Revinate customers include 23,000 of the world’s leading hospitality brands. With both mobile and desktop solutions, Revinate helps hoteliers manage online reputation, understand the competition, and collect and analyze customer feedback to drive business performance. Revinate is backed by leading venture capital firms, including Benchmark Capital and Formation 8. To learn more, please visit www.revinate.com or email info@revinate.com.